On the 29th September 2018, West Coast Eagles met Collingwood in what can only be described as a thrilling game. With so many people in attendance, the planning and infrastructure must be carefully planned and executed. 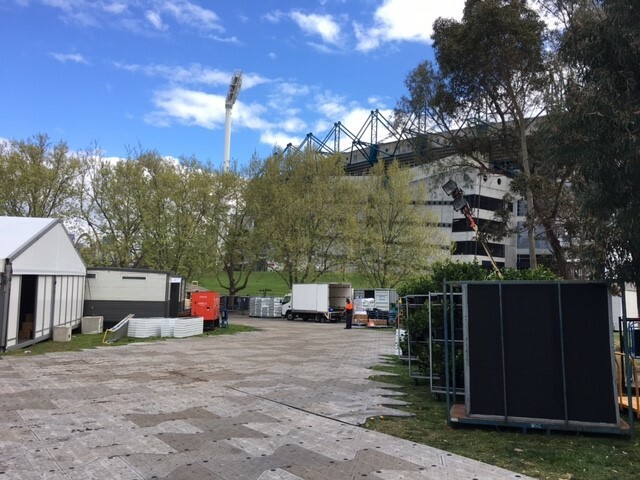 The AFL partnered with No Fuss Event Hire to provide equipment, which included heavy-duty I-Trac Roadways and Supamats, for installation and removal of infrastructure and activities used for the footy festival. Supa-Trac temporary flooring was laid to create pathways for prams and wheelchairs during the event. Grandstands and marquees were provided for the 3AW broadcast site. 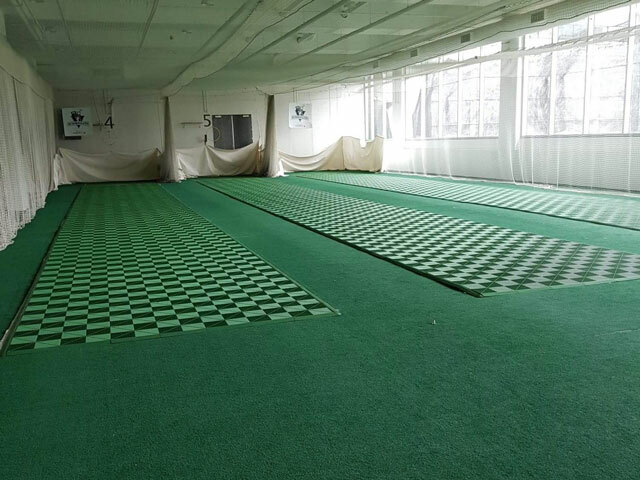 Plastorip was installed as exhibition flooring to cover practice wickets and create a media room. It was imperative the integrity of the turf was protected. 1,430 sqm of grey I-Trac was laid to create temporary roadways for large commercial vehicles to enter and exit the ground. I-Trac is a single component heavy-duty, temporary road access application. It allows vehicular traffic over unstable and uneven ground. I-Trac is a composite interlocking roadway system and creates a contiguous surface capable of dealing with all road-going vehicles and extreme static loadings. It is manually installed system and is secured by an inbuilt connection device that requires no special tools to operate. Each panel has 8 attachment points that enable the installer to bolt on accessories where needed. I-Trac is not sensitive to most chemicals and offers a certain level of electrical insulation. 100 Supamats were also laid around the site for further support and ground protection. These Supamats are often referred to as bog mats or Trakmats and are made from 100% recycled high-density polyethylene plastic. They incorporate cylinders on both sides which have proven to be a superior design for providing gripping action in all weather conditions. The open space between cylinders create the necessary pathways to release mud and debris from the traction area. With the typical truck tyre being in contact with at least 36 cylinders at any one time, there is sufficient load support and gripping power with this temporary roadway. All cylinders are paired with an identical cylinder on the reverse providing the traction between mat and ground. 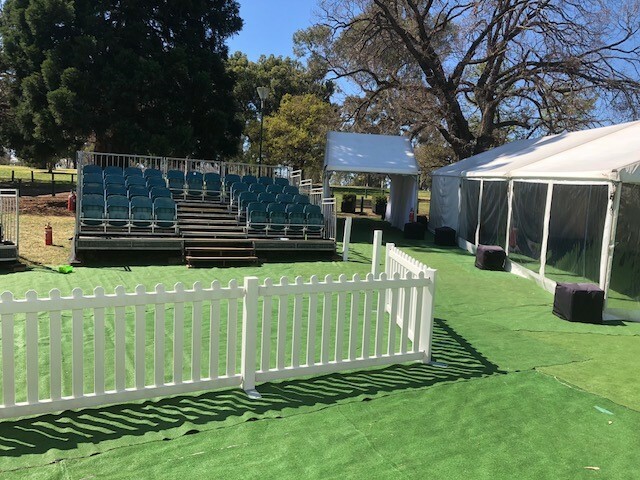 As a recognised supplier of temporary grandstand seating systems to Asia Pacific’s major events, No Fuss Event Hire provided 3 x 35 seat grandstands during the event. A 6m x 12m, 9m x 6m and 6m x 3m marquee structure were erected with silk lining hung in each. Our range of structures can cover sizes to create the perfect atmosphere and weather protection for any event. The modular structures are erected by trained staff equipped with the latest technology to ensure minimum impact on site and can be erected on any surface including grassed areas, asphalt, concrete and compacted soil sites. With 189 square metres of green Plastorip, this unique temporary flooring application can essentially be designed to your own flooring, thanks to our range of colours. Plastorip will emphasis any display, whether it is a corporate exhibition stand, promotional event or pedestrian walkways. It is also a great branding technique that will complement your products and events. Plastorip is practical for both indoor and outdoor use. It is a surface suitable for dancing and dining, has a non-slip quality and combines with moulded non-trip edging.